A girl learns as much about being a woman from her father as she does from her mother and the learning starts much younger than we think. Tween expert Nancy Rue, and her husband, Jim, guide fathers in relating to their tween daughters as they make the transition from girl to young woman. ^^^Dads, finally a guide to your tween daughter! This companion book to the FaithGirlz novels, devotionals, and Bibles, focuses on four tween issues appearance, body and mood changes, girl politics, and authenticity. 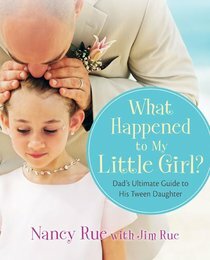 Let tween expert Nancy Rue, and her husband, Jim, guide you in helping your daughter live as a girl-child rather than a mini-teenager. Empower her in spiritually sound behaviors as the rate of aggression rises among tween females. Show your daughter how to not only avoid but take a stand on the twisted parts of her culture such as peer abuse, shallow consumerism, and an unrealistic sense of entitlement. Give her alternatives to the toxic media, and encourage her to become part of something bigger than herself through charitable, God-centered activities. Learn to model the growth of a deep, personal connection with God, which makes all of the above not only possible, but probable. In the midst of a world saturated with poisonous role models, it is possible to raise your daughter to be a respectful, confident, God-centered, young woman. About "What Happened to My Little Girl?"